It feels a little disingenuous for me to talking up a series which I can’t even watch in my area (Cox Communications in Hampton Roads, VA, has yet to pick up Fox Reality), but as someone who works at home and has a 4-year-old daughter, I respect the concept of “Househusbands of Hollywood” enough to do at least a little bit of promotion for it. 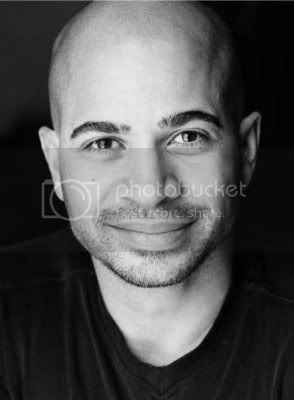 I’ve already detailed the TCA panel about the show, but when the opportunity to sit down with one of the cast members – Darryl Bell, late of “A Different World” – became available, I couldn’t resist. In addition to his time spent on the “Cosby Show” spin-off, Bell has worked with Spike Lee and done time on a rather infamous sci-fi sitcom, but he’s still very much a working actor. He’s also the significant other of former “Cosby” kid Tempestt Bledsoe, a relationship which led him to this reality-show endeavor…and led me to my first question. Bullz-Eye: First off, you two seem to be almost a ringer on the show. You’re not even husband and wife yet! Darryl Bell: That is a good way to put it, Will. We are the ringers. That’s probably caused the most frequently asked questions, like, “You guys are the only couple who is not married, you’re the only ones without kids, so what are you doing here in a show called ‘Househusbands’?” The short answer to that has been Marilyn Wilson. Marilyn’s a good friend, produced Temp’s talk show. Marilyn and I have been out, pitched shows’ and tried to sell other things. We’ve worked together in that capacity. It was her assurances that we’re trying to do something that’s fun and not trying to ambush anyone or be mean spirited. “Come be a part of this, because we think you guys are hilarious.” Apparently, the more that I have even talked to other friends, they are, like, “Oh, we’ve been saying for years that you guys should have your own reality series, because you are just funny.” It just happened to come in this format. I don’t know that we would have agreed to have done this for anyone else. So, there you go. DB: And I don’t know what that means for me, anyway, only from the standpoint that people ask me that because I’m on this show. But in terms of work-wise, it’s just like…even in the series, when Tempest was coming back from on location, shooting the film, I was going on location to shoot this show for TV One. That’s really the nature of our relationship. You know, it’s rare that we’ll both be doing something at the same time, but we’re always in this cyclical gig that is being a working actor in Hollywood. That’s just how our lives have operated. I was just saying in another interview, when Brad is off shooting a movie, Angelina isn’t always shooting one. She’s somewhere with the kids. Or when Angelina’s shooting and Brad is somewhere…? That’s just the way it works. BE: So what kind of husbandly responsibilities do you have? I mean, do you chip in, doing the dishes or whatever when she’s not there? DB: I mean, I can’t really call it husbandly duties. Our house is not a pigsty, but I can say that some of that is attributed to the housekeeper. You know what I mean? That helps out a lot. I can only say that when I think of that…when anything breaks, like most men, it’s, like, “Darryl, come fix it,” you know? I get that. But as a regular responsibility, that’s not me. BE: Is there anything you do that would typically be considered a gender-specific thing, something that one would normally expect a wife to do? DB: For us, no. For us, I guess that’s what has been so good: we have talked about not having an ego about anything. She likes to cook, so she has cooked for me, but I’ve cooked for her, you know? So from a relationship standpoint of view, I can’t say that…we don’t have any specifically defined roles, other than, as many men will find the case, she wanted pets and yet somehow they are my responsibility. You know how that works out. BE: Hey, I feed our cat. DB: Exactly, exactly. And what man asks for a cat? That’s just not the way it works. I want a Neapolitan Mastiff, but the reason I don’t have one is because she wanted a cat. BE: Sure, that seems fair. DB: That’s a whole different relationship kind of issue, you know what I mean? It’s not specific to the show, but that’s how it worked out. BE: So is there any interaction with you two and the other couples? Because I literally just got a copy of the screener, so I haven’t seen the show to know. DB: As actual couples, we don’t get together until the end, but there’s a lot of interaction between the other guys. We get together to do the “man cave” segments together. And we all went on specific outings together. I spent time with Billy, Charlie and Danny spent time together, and Grant and Billy, so individually we did things together that we also shared in that respect. And then we all talked about that, and that was fun. The interactions between us…we all like each other, you know, so it was fun to hang out with each other and get to know each other a little bit. BE: Did you know any of them beforehand? DB: No. I’m not sure if anyone else did, but we got to know each other through this. That was really it. I certainly can say that we are now linked together forever. (Laughs) So that’s not a bad thing, they are a good group of guys. BE: So how much acting do you do nowadays? DB: Often. All the time. The only reason I’m here is because I had to have another pilot audition moved just to be here. That’s one of the interesting things about the life of an actor, is oftentimes the work we do, you can’t always see, you know? For a pilot that was shot but didn’t get aired, or auditions you’ve got to go on, and development meetings and all this sort of thing. That’s part of the job. You know, when I listen to Ron Howard talk about how “this is a film that was ten years in the making,” I’m, like, well, during those ten years, even though he does a film every couple of years, in between it’s about working on what the next one will be. That’s the life of an actor. When you look at the television landscape now, there isn’t a whole lot of television that you go, “That’s great,” you know? Even film-wise. Look, some of our biggest film stars now are doing television. Kyra Sedgwick is on TV; Laurence Fishburne is on TV; Glenn Close is on TV; Jeff Goldblum is on TV. A lot of our film actors are doing television and doing great work on TV. But with the industry so fractured with all of the channels now, it’s just that finding good work and a good project for you has become increasingly difficult. You’d think it would be easier, but it actually has become more difficult. So what can you do? Just keep putting one foot in front of the other. I’m getting ready to shoot a new pilot for a talk comedy genre show next week. So we’ll see how that works out. BE: Is that for TV One? DB: TV One is the other project. This isn’t necessarily for TV One, although they are one of the folks that we have talked to about it. But we’ll see what happens. BE: I want to ask you about a couple of other things you have done. 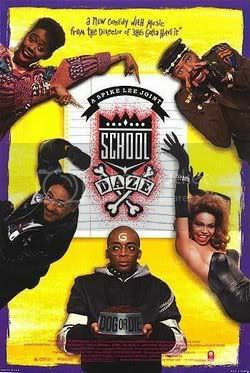 BE: How did you get involved with “School Daze”? DB: I was a student, came home for the weekend, saw Spike Lee at a screening of “She’s Gotta Have It,” I asked him for a part in his next film, and I got it. BE: Wow, it was that easy? DB: That is the abbreviated version, but that is basically what happened. “She’s Gotta Have It” was playing on 68th and Broadway in Manhattan. I ended up there as a result of a fight with my girlfriend at the time. Because I was at Syracuse…I left school to drive down to where she lived in Brooklyn, which was in the deepest part of Brooklyn, and she wanted to go see “She’s Gotta Have It.” I’m, like, “It’s only playing in Manhattan. It took me four hours to get here, and now we’ve got to drive another hour to get it?” And so it led to this big fight. Needless to say, she won and we were on our way to Manhattan to go see “She’s Gotta Have It.” When I got there, Spike was outside selling t-shirts. I asked, “How much are the t-shirts?” They said, “Ten bucks.” I said, “Well, that’s too expensive for a t-shirt,” and they said, “Well, what would you like?” “A part in his next movie.” “Go ask him.” So I did. I told him they were too expensive, and he said, “Are you an actor?” I said, “Well, sometimes.” He said, “You either act or you don’t.” I said, “I do.” Spike gave me his address, told me to send him a picture and a resume. I didn’t have an agent, wasn’t acting. I was an economics major on my way to work for my father’s brokerage firm in New York. And I got back to school, got a friend of mine who was a photography major to take head shots for me, sent them to Spike, got an audition and booked it. So I left school to go do “School Daze,” and after “School Daze,” the movie wrapped up in May, which is when I should have graduated. Instead of going to summer school, I had planned to come to Los Angeles for the summer. I came to L.A., my first month here I witnessed a freeway shooting, I was in an earthquake and caught the chickenpox. So there you go, that was my introduction. DB: Yes, exactly. And then right after that, in August, September…you know, right for pilot season in 1987, which was the regular television cycle at the time…they were casting for “A Different World.” And I never looked back. BE: Nor should you have. DB: I’ve been fortunate. I have been very lucky. BE: When they first pitched you the show, how did they pitch it to you? DB: The original script for “Homeboys” was very clever. And it was satirical and it was funny, because one of the biggest fans of “Homeboys” was Roseanne Barr. I remember talking to Roseanne, she came up to me and said, “You know, the problem with ‘Homeboys’ is that they went cartoonish. 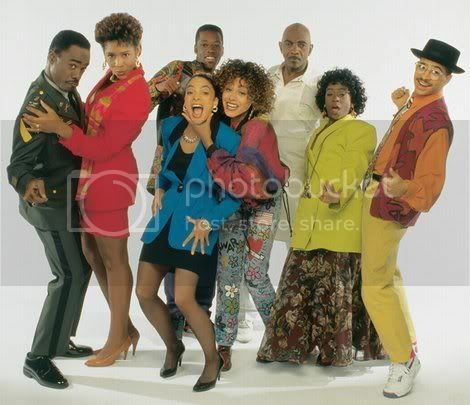 It should have been satirical like ‘In Living Color,’ then it would have been great.” That was the original plan, but as often happens, shows take on a life of their own. Once we got started, we did one episode where we went to the planet of whatever, and there was a network executive who said, “That’s the show!” And the next thing you know, we were going to “The Planet of…” every week, and the comedy would ensue. What’s interesting is that I remember when I was concerned about it, I called Dr. Cosby to ask him, “What do you think?” He said, “It’s not the worst thing on television, but it does remind me of bad Saturday morning cartoons.” I’m like, okay, well, if that’s the worst thing about it. Now, the legend of “Homeboys” has become much more incendiary than the actual show. It’s funny how I usually challenge most people who talk about how much they disliked “Homeboys” to name me five episodes. Most of them can’t, because they just bought into the “oh, it’s awful, just the title. Oh, it’s terrible.” What’s interesting is that I had a great conversation with Chi McBride, who was doing “The Secret Diary of Desmond Pfeiffer,” which was infinitely…if you want to talk about in terms of the imagery of what was wrong, that show was much more infamous than “Homeboys.” Yet it’s not remembered in the same way because the title didn’t grab you in the same way. I remember Chi pulled me aside and he was, like, “Look, everyone who is criticizing what you’re doing would take your job from you in two seconds. All of them. So all I can tell you is that this is one blip on both of our careers, and we are moving on.” And, look, Chi has moved on, as have I. I want to say that right after “Homeboys” went off…I can’t remember if that’s when I was doing Diane English pilot or if that was another pilot with Carol Burnett, and neither of those ended up making it to air, but what I’m saying is that those are the people I was working with right after, you know what I mean? “Homeboys” has never been an impediment to my career or my ability to work. It’s just been the topic that everyone loves to rehash in terms of “we just think it was terrible, it was awful” and so forth. BE: Well, I’m a “Star Trek” guy, and James Doohan was on there, so that alone made me at least want to tune in and check it out. 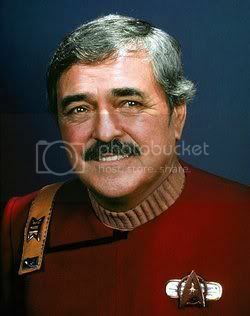 DB: James Doohan was on there, and so was George Takei. And…oh, why can’t I say Adam’s name? Um…Adam West? DB: Adam West was on there, and so was…oh, I can’t tell you the other gentleman’s name, but he was Gomez from “The Addams Family”. DB: John Astin. Thank you. John Astin, who was just the sweetest guy. But, I mean, Adam West was cool, too. BE: In other words, it had sci-fi street cred. DB: It did. That’s what I’m saying. That was the whole point…and James Doohan was the sweetest guy. Oh, he was just so wonderful to us. But…I want to say it was a UPN show, but I believe either Paramount or the Roddenberry estate was unhappy that we were satirizing Scotty as a character. So then James Doohan came out of the show, and when James Doohan came out, I was, like, “Oh, no.” That was one of the things that was so good about the show, that you had actually got him to have fun with this role. And I thought that’s the way this show was going to be portrayed. It’s one of the things that to me was interesting about what “Homeboys” could have been. Because whenever people talk about the future, if you look at some of the best futuristic movies, from “2001: A Space Odyssey” and all the others, generally African Americans aren’t there. I mean, it’s like we don’t make it to the future, except in the “Star Trek” series. Those are the few places. I had the privilege of meeting Nichelle Nichols at the NBC 75th Anniversary, and she was just like a queen. She was so regal and so wonderful; she was terrific. Just being able to say to her “thank you for being one of the pioneers that opened doors for me to be able to do what I do” was terrific. You say you’re a Trekkie, right? DB: Interestingly enough, someone was saying to me that it has been long rumored in folklore that she and William Shatner’s kiss was the first interracial kiss on television. But, actually, no, that’s not true. It was Sammy Davis, Jr. and someone else in an earlier picture. And then they said that their kiss wasn’t even the first interracial kiss on “Star Trek.” It was when Captain Kirk kissed the Asian actress who was the warrior and the tear could make you fall in love….? Their kiss was the first quote, unquote interracial kiss. I was, like, “Look at that, I learned something.” And I even made you go “wow,” I think. BE: You are correct. I did not know that. BE: What’s your favorite project you’ve worked on that didn’t get the love that you thought it deserved? I guess you can include pilots in that, given that you’ve worked with some big names in pilots. DB: Wow! Wow, that’s interesting, and I will tell you that it’s a toss-up. I would say in one sense, it would be the pilot I did with Jim Burrows, which we all thought was terrific, but it just happened to come at a time when reality TV…how’s this for irony? Reality TV was just starting to take off, and I want to say that it was “Meet the Parents,” “Average Joe,” “The Apprentice,” and I think they were about to do “Average Jane.” I think that was coming up, and all of them were taking up our blocks in NBC lineup. Additionally, they had already agreed and dropped $55 million on the Siegfried and Roy animated series. DB: Yeah, “Father of the Pride” was coming up. So they had all of these things they had already committed to that I guess they didn’t they know would be successful before the upfronts. But by the time they had already renewed them for a second season, the window for available space for television wasn’t good. They had ordered, like, 24 pilots, and this was like Jim Burrows, Larry Wilmore, who had gotten an Emmy for “Bernie Mac,” and Henry Winkler was in a part. We even got a day off filming the pilot, which never happens, but it was because it was so tight. And it didn’t get picked up. So I was disappointed in that. But the other answer to your question would be “A Different World.” Dr. Cosby always said that our show was the goose that kept laying the golden eggs, but they never wanted to credit the goose. They always wanted to say that we were a show that was a beneficiary of our time slot. Notwithstanding the fact that I think in our third season, we beat “Cosby.” They also never wanted to give, I think, Debbie (Allen), Susan (Fales-Hill), and the writing staff credit for being as funny and topical as they were with the shows that still hold up now on AIDS, war, racism, and all the things that we did. We’re still one of the 50 highest rated shows in television history. DB: It’s been in syndication for 17 years. We’re only the second show in television history to debut at the number two spot, behind “Bewitched.” I could go on, I’m good with the numbers. You know, everyone in the cast was always, like, “If you want to know the details, you’ve got to ask Darryl,” because I remember all that. So that would be the only other thing. People tend to look at our show, some people, under the umbrella of “Cosby” success and don’t give the people who put in a lot of good, hard work and were really good at what they do, for our show. But, you know, for what that show didn’t get in terms of that kind of recognition, to have shared the stage with Whoopi Goldberg, Lena Horne, Diahann Carroll…I mean, it paid dividends in so many other ways. It was the best. 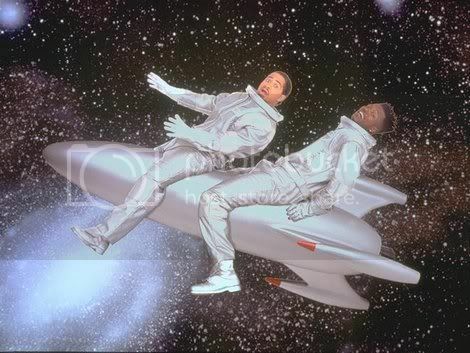 BE: Do you still talk to Kadeem Hardison and Jasmine Guy, or at least keep up with them? DB: Yep. I saw Jasmine in New Orleans last week. I was hosting a symposium on Hollywood, and Jasmine was there choreographing a number. Kadeem just texted me ten minutes ago. Let’s see, I’ll see Debbie probably sometime this weekend, she’s doing something at the dance academy. I usually call her about “So You Think You Can Dance” all the time. 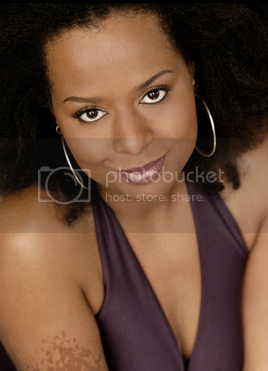 Dawnn (Lewis) and I were at a function together not too long ago. So yeah, we don’t all get to see each other collectively, but we do still see each other from time to time, and it’s always love. BE: And I should close with one more about your current show. BE: So what are your expectations of “Househusbands of Hollywood”? Are you going in with concerns about them being too invasive, or…? DB: You know, I really don’t know. I can’t say that I have any expectations. I’m curious to see what will happen. If I’m to judge by most of the questions we have gotten so far, I think the challenge is going to be for people to be able to get past the title, to see what the show is really about. And if that happens, that could be fun. And we’ll see where it goes from there. So it will be interesting to see what happens. So my expectations are that we will either change some minds and be really successful, or something that I haven’t conceived of will be the answer. (Laughs) One or the other, right? Hello Darryl, I’ve enjoyed your work over the years. You probably dont remember me but the last time I saw you was in NY at your aunt Karen 70 street apartment . I beat you in backgammon. I first met you when you were 14 years old living in Morristown NJ. I was engaged to your aunt Karen and we lived in Ny together. Iwas also friends with your late father. Karen and I were together for about 6 years. If you know how to contact her please forward my email address. Thank you in advance. Keep up the good work. You are really very funny. May God keep and bless you and your family. Don Thornton, CEO, One Touch Systems, Inc.